By Joshua Binus of Portland, Oregon. Joshua is the Director of the Ballot Measure Archive Project and a Public Historian. It is fairly well known that Oregon has the longest running use of the initiative and referendum system in the United States and that our state has been one of the most active users of the system during that time. But I would hazard a guess that most people are unaware that the vast majority of the historical records generated from that system have been destroyed. Why? The answer is simple: there was no place for them. The Oregon Legislature has never charged the state archive with the responsibility to fully document initiative and referendum campaigns. True, a number of records are retained by the state archive, but a majority of those are destroyed within ten years. Even historically valuable campaign finance reports and election law complaints and violation cases are destroyed after only six and ten years respectively. Essentially, because a substantial number of players in the initiative system work outside of the state government, their records have been off limits for permanent preservation in the state archives. For the past three years I have had the pleasure of working with roughly 120 other researchers at Portland State University on the Ballot Measure Archive Project to address this problem. By the end of this term, we will have collectively invested nearly 20,000 hours of labor into the effort of identifying and tracking down thousands of initiative participants from 76 different campaigns dating from 1960 to 2004. So far the project has been a success, having amassed over 100 cubic feet of valuable historical material that people have been stubbornly holding onto sometimes for decades. They knew it was important, refused to throw it away, and have been waiting for someone to contact them so they could see their materials enter the public domain. Unfortunately, for every person who has held onto their campaign materials, another fifty have destroyed theirs or died before we could contact them. All too often, initiative veterans have lamented not being contacted a week, a month, or a year sooner, having only recently sent all their records to the landfill! While this has continually frustrated our researchers, the loss extends far beyond our disappointment. Those irreplaceable records are gone. Forever. 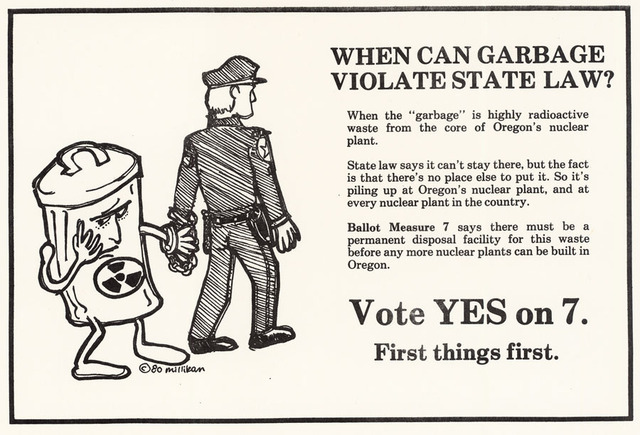 The Ballot Measure Archive Project was launched to document and preserve surviving evidence from Oregon's rich history of direct democracy. From the beginning this work has been carried out with the added goal of digitizing and housing the records in a centralized archive so that the public could eventually have both virtual and physical access to everything we are now in the process of collecting. It is our hope that meaningful public access to BMAP holdings will, in turn, encourage people to craft evidence-based arguments and make more measured observations about the state's initiative system. Compared to the emotionally and ideologically driven diatribes that have become the norm in recent public discourse, it is our hope that our document-based archive will allow for a more reasoned discussion over Oregon's initiative system. Thanks for the interesting information -- keep up the good work (from a fellow History geek)! Ditto Kristin. Important work. Is OHS involved or supportive? In the longer run do you think we should try to get the Leg. to the Archives such a charge? It might be worth contacting archives of Oregon colleges and univerities. Interesting stuff can turn up there. I know for instance that from the '20s to '40s there was a Pol Sci prof at Reed who had pretty extensive civic engagements & seems a possible candidate for initiative involvement. Reed also has an oral history project going now, looking toward the college centennial in 2011, that might capture at least glimpses of such things, though maybe not since in the nature of things the focus will be pretty college-centric.